Matt Malina surprises us with each and every tournament he takes part in. At the end of June the Individual AIDA Pool World Championships took place in Belgrade, Serbia. Matt defended his DNF World Champion title and won a medal in each discipline he took part in – as the only competitor! In his best discipline, the DNF (no-fin dynamics) he placed 1st and defended his World Title, diving 226m on June 28th, 2018 which is unofficial World Record in an Olympic pool (50 m long). It’s worth mentioning that this was his 3rd time in a row winning this discipline! In DYN (dynamics with a monofin) Matt says he “got lucky” and won a bronze medal diving 203m. The last start of the tournament was the STA (static holding breath underwater) discipline, where Matt also won the bronze medal AND a National Record of 8 minutes 46 seconds! During those 6 days I had one hard day, when the tiredness caught up with me as well as the pressure, which resulted in me giving up on my dive too early – during the DYN finals after turning at 200m I was feeling like 250m during training – I couldn’t fight it, my body wouldn’t listen. What’s important, every tournament start is a lesson for future dives, there are no failures. After all, you can’t win everything. This time, the tournament was joined by Matt’s training partners Karol Karcz and Michał Dąbrowski, and the support of the “Limitless Team” was visible throughout the whole tournament. Matt would like to thank everyone who supported him during his preparations as well as during the tournament and is proud to be able to represent his home country Poland on the international level with many great athletes! The freediving season is slowly starting and the best freedivers in the world are warming up for the upcoming world championship competition. Matt Malina, Grena® sponsored athlete started out strong with breaking yet another of his records! 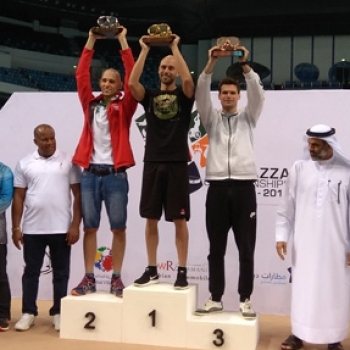 An early spring competition is the Fazza Championships, which is being held annually in Dubai, UAE to commemorate the country’s ancestors. This year it took place on 23 – 24 March, 2018. 2015 was Matt’s first attempt at the competition and fromt here he slowly started to adjust his training to suit the rules of the to the competition – very different than the AIDA. To put it simply, it’s a competition in static breath-hold, holding on to a rope without any equipment. When asked, what motivates him in his journey as a freediver and athlete, Matt always says it’s to surpass his own limits. During this competition, he proved himself right and surpassed his limits with a dive of 10 min and 4 seconds and taking 2nd place in the competition. First place took the amazing Goran Colak, with incredible 11 minutes 6 seconds and 3rd to Veljano Zanki with 9 min 21 seconds. There was also a 4th person in a party, Branko Petrovic with ~10 minutes 10 seconds but was disqualified due to blackout. Preparing for Fazza involved a lot of fasting and caloric restriction. Matt started at the Fazza competition weighting 72 kg, which is 14kg (!) less then when he was in his top dynamics shape while setting world records in world championships in 2016. That is a huge change in the body and how it works under water. All of this wouldn’t be possible without the amazing support of Matt’s wife – Ola, who supported him during the preparations, often sacrificing a lot of time to help Matt train. Not without an importance was the help of Matt’s training partners Karol Karcz and Michal Dabrowski! We are happy to support you, Matt! And wish you great success in the coming season! Matt’s next competition will be on home turf in Jaworzno, Poland on May 12th and in the Czech Republic the following week. The next Championship competition will be in less than 3 months at the AIDA Individual Pool World Championships. The event will be held from June 23 to July 1, 2018 in Belgrade, Serbia. Matt will talk at a local TEDxWSB event in Wroclaw, Poland on Tuesday, pril 24th at 10:20 AM about Freediving and how to manage your emotions. The talk will be in Polish, but let’s hope for some English subtitles coming soon! In September 2016, at the Brno MiniComp in Czech, Matt Malina attempted to break the current record in Bi-Fin dynamics. First of all, some background info. 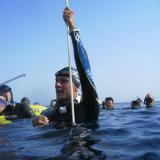 Matt usually competes in competitions defined by AIDA rules - one of the biggest freediving organizations. The bi-fin dynamics discipline is not officially recognized by AIDA, but it is by CMAS and Pure Apnea (other organizations and other conditions). The competition (Brno Minicomp 2016) was organized on AIDA/Pure Apnea standards, thus this record is official by Pure Apnea standards and unofficial (not recognized) by CMAS. There are 3 different techniques for swimming with bi-find, and Matt went with the one which proved to be the most effective for him, the "hands above the head and dolphin kick". With having 4 (yes, four!) training sessions with bi-fins behind him, Matt attempted to break the current World Record, which was at 226,5 m, done by Andrea Vitturini (ITA) during CMAS 9th Indoor World Championships. "I came up crystal clean at 231 meters and got 2 meters off my performance because of turning below the step. I knew it will happen but decided to not care about it during the dive. Relaxation is the key and I was focusing on that. I think with flat pool, fully optimized and pushing to my maximum, 250 + should be very well possible, but lets keep something for the future." We will definitely look forward to this kind of future! You can read Matt's full relation here. Matt participated in the AIDA Individual Pool World Championships 2016 and surprised everyone with breaking record after record! The competition took place on 25th June - 3rd July 2016 in Turku, Finland. Matt broke three world records during this competition - one during the eliminations and two in the finals. You may not believe but literally after yesterday’s 300 [m] I was in constant movement and only now after getting back home I have a couple of minutes to write few words about World Championships in Turku. There is a lot to write about which I will do at some point. I'm full of emotions but this picture of Daan Verhoeven describes it all. I have broken 3 World Records in 2 disciplines, 232m in DNF qualifications, improving it in finals by another 12m up to 244m. To me it is a history, it’s a record that lasted 6 years and no-one thought it will be beaten any time soon, at least not until last month :) It means to me so much more than that 300m but it’s less admirable by people because it’s not a round number :) I still can’t believe that I have improved it by 12m and there was much more in tank. I’ve calculated a few months ago that I should be capable of doing 252m on a perfect day, based on my speed, stroke count etc. but even that number is wrong. Numbers are wrong, it’s all wrong because it’s Limitless. Numbers are in our heads and on this championship I’ve focused on making good dives with good feelings, keeping thinking about numbers just for last part of dives as a motivational tool. I must say it worked wonders for me! I came to Turku to defend my DNF title, DYN was the 2nd priority because I knew there will be no rest after DNF finals and there are athletes strictly focusing on DNF or DYN only during this championships. On the other hand, I knew that if I can do around 250 DNF, 300m DYN shouldn’t be a problem even without rest so let’s try to swim and see how it goes. I did it, I have swum 300m and became World Champion in DYN, splitting the record with Georgios Panagiotakis but I got the gold because my announcement was higher (it was closer to actually reached distance by 1m). You can find some English posts there, too. Stay tuned for more info from the Champ! Today I have finally some time to write-up about the events that took place over the last weekend! Polish pool championships was a triple win for me. I have improved the AIDA World Record in dynamic with fins by 4m up to 285m, I have become the Polish Champion and I have achieved the highest ever combined score of 327,5 points with world record dynamic, 8:00 static and 178 no fins dive in less than 24h. Four weeks ago when I’ve swam 258m dynamics with fin in a short pool, I’ve decided that it’s possible to achieve world record even before Worlds in Turku. I thought it would be a shame if I do it and there is no judge to ratify it. I’ve contacted very friendly organizer, Lucyna Kicińska (she is an angel of Polish freediving organization!) and she said they will try their best to bring one, few days later I got confirmation that Petar Bojovic is coming. That’s the moment when things got serious because there was no way back :) Soon I realized that I actually haven’t swam dynamic in a 50m pool since Belgrade 2015. Over the next two weekends after my decision to try for a record, I’ve travelled to Jaworzno which has a 50 m pool. Being used to train and perform in the morning, I found out that in the afternoon I have a harder time to perform good. The pool had uncomfortable steps at the bottom, it was very hot (32-34 air temperature) and high humidity. I was sweating just by sitting in a wetsuit and my heartbeat was high. Actually it was much harder to achieve same results as in the 25m pool I usually train at. So my morale wasn’t high and I was giving myself 25-30% chances to succeed. I was afraid of the pool in Lublin because it has a step in the middle where the bottom starts to gradually fall from 2,5m to 3,9m. However, when I first tried to swim in there on Wednesday evening, all the fear went away. I was feeling such freedom underwater like I have never felt during dynamic with fins swim. The pool is huge, air temperature inside is just perfect and there is not too much humidity. It’s just perfect to set records in there. Now when I think about the other 50m pool I realize that I was just feeling claustrophobic in there with hitting the bottom constantly with my knees every time I’ve encountered a step at the bottom. Below You can all watch video of my World Record performance. From 225m my legs start failing, but it didn’t stop me from swimming another 60m with hybrid DYN/DNF technique. After all I’m a no fins guy who tries to find his place in the monofin division :) It’s weird though because normally I don’t get to a point of total leg-muscle failure. Remember to always make an emotional connection with Your goal and let nothing stop You! Well at least if You perform pool disciplines, because that philosophy doesn’t work at all in depth ones! Last but not least I would like to thank everyone for their support! Especially to my beloved Ola, she is always there for me, supporting me, coaching me, none of this success would be possible without her, we are a true dream team :) Thanks to my official sponsor, Grena LTD who supported me in a hard moment of my career two years ago, thanks to the organizers of the Polish Pool Championships, especially Lucyna Kicińska, to Samo Jeranko, who helped me with choosing the right fin #zolotov #goldfin, to Karol Karcz, Michał Dąbrowski and Marcin Pałkus for training with me, my parents who always support me and many, many others! The Polish Pool Championships took place from May 27-29th, 2016 in Lublin, Poland at the Olympic-sized 50m Aqua Lublin pool. We chose some of the most interesting pictures for our website gallery, please visit it here. You can also view more than 300 pictures by Patrycja Radiowska-Polak from the whole event on Facebook here.